The port authority in St.Petersburg prohibits independent tour operators from entering the port for 90 minutes after a ship docks in St.Petersburg. Guests booked on Princess Cruises Shore Excursions will not be delayed and will be given priority disembarkation. St. Petersburg has provided a historic stage since the day Peter the Great ordained its construction on the banks of the Neva. In its relatively short history - the city is younger than New York - St. Petersburg has witnessed the rise and fall of Imperial Russia, three shattering revolutions, and civil war. The city survived a long and tragic siege during World War II - indeed St. Petersburg became a symbol of Russian resistance to Nazi invasion. Russia's "Window on the West," St. Petersburg remains one of the world's most beautiful metropolises. Perched on the banks of the Neva, the city is crisscrossed by canals. 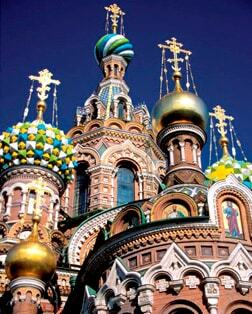 Two great architects helped bring Peter the Great's vision of St. Petersburg to life: Rastrelli and Carlo Rossi. The rich architecture that resulted features a mixture of styles from ornate Russian Baroque churches to neo-classical palaces. St. Petersburg has also been the cultural soul of Russia, a repository of priceless art and a home to poets, musicians and composers ranging from Pushkin to Shostakovich. With an art collection to rival the Louvre, the Tsar's former Winter Palace and four other buildings is home over three million artworks, including paintings by Da Vinci and Rembrandt. Known as the 'Russian Versailles', the ornate palace overlooks the Gulf of Finland. The Grand Cascade fountain features Samson prying open a lion's jaws as water cascades down terraced steps. Designed by Rastrelli, the opulent baroque Palace features a gold dome crown and is set in 1,400 acres of spectacular gardens and parklands. Visitors enjoy the gilded beauty of the Throne Room. Built to protect the city from Swedish attack, the fortress was a place for imprisoning political prisoners. The ornate interior now boasts the tombs of many Tsars, including Peter the Great. This restored church boasts a dramatic "Russian-style" exterior and is built on the site of the March 1, 1881 assassination of Tsar Alexander II. The church is decorated with colorful ceramic tiles. The cathedral's central gold dome is one of the largest in the world, and covered with 220 pounds of gold. It was commissioned by Alexander I in 1818 and took more than three decades to complete. Peter the Great conceived the River Neva as the main thoroughfare of the city, so that it could transport people and merchandise alike. The pretty Fontanka and Moika Rivers also run off the Neva.